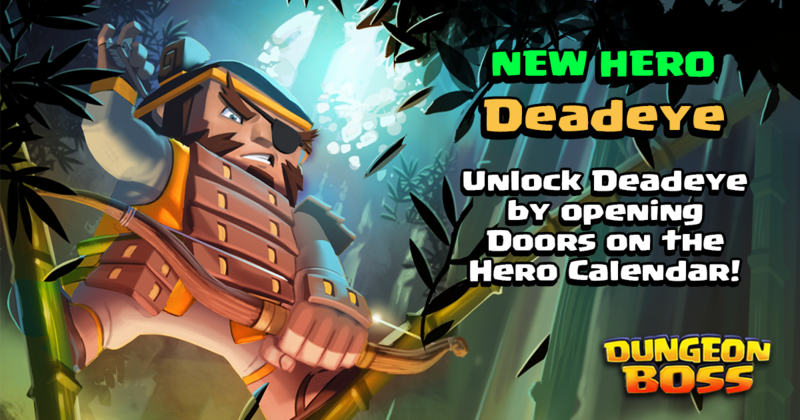 Deadeye is here, and he's keeping his eye on you! There will be a hero calendar with doors that can be opened each day with different keys (check out the fancy new key designs!). You'll be able to get bronze keys from each day's quests, and can also buy keys in the shop. This event will involve event tickets. Tickets can be found all over the game, and running dungeons with Honorbound heroes will double the number of tickets you get. There is a guild event associated with the event, similar to the one from Winterfest based on the number of tickets your guild collects. Rewards are based on thresholds, and the rankings are not competitive. If you are in a guild, 50 tickets will be sent to everyone in your guild every time you use a gold key. This is not listed on the door, but you can see who has gotten tickets for your guild by checking the guild chat. You can only open door 1 on day 1. On day 2, you can open door 1 and 2, but can only open door 2 if you've opened door 1. This continues until day 14. On day 14, if you open the last door, they will all reset and you will have the option to open any/all of them again if you so choose, in any order you want. Using gold keys on all 28 doors will allow you to 6-star Deadeye AND collect a bonus quest for an Elite Light Rune! The event shop will be extended at least a day longer than the event itself to give players a chance to spend all their tickets. A second set of repeatable quests will be added in the second week of the event. These quests will be different from the first set of repeatables. On Day 13 of the event, we will be giving a free Gold Key to all VIP 10 players, a free silver key to all VIP 5-9 players, and a Bronze key to all VIP 1-4 players. Some of the doors pay out runes. You can long-tap on the runes to see their stats and rarity. Please note that rune rarity will vary by level. Players level 1-29 will get improved runes, 30-49 get greater runes, and 50+ get superior runes. The rune payouts WILL update as you level up, and are not locked in at the start of the day. So if you start a day at level 49 and hit level 50 before opening a door with a rune, the rune will be superior. Will there be a 2nd Set of Repeatables like the Drakk event had? Yes, there will be a 2nd set of repeatables. @joel strongly encourage another look at rewards on this. It’s a 2.5 week event and there’s literally nothing for end game players to try for. No runes in event shop (not even superior, forget elite), no ultra materials, no tokens for newer heroes, no elite shards/binders, no temporary boosts, not even a gold option to turn tickets into. No rewards for individual leaderboard. Only a superior rune for top rewards on guild leaderboard. As is, we’re all going to farm tickets for a couple days to buy enough keys and that’s it for the whole event. I think Barbarians are doubling event tickets, not the Honorbound. you'e doing a better job of explaining things on the banners, but this was left out. I suspected it, so I had to come here to confirm. I'm seeing Honorbound heroes doubling tickets. Is anyone else seeing Barbarians doubling them? Yeah I also agree there’s not much to spend tickets on. Maybe add a corrupted heart ? You got the titles pre event ?
" I dont care for meaningless cosmetics "
Titles are worthless, you can type your own title in before your message. Yeah I definitely agree that the tickets are literally going to go to waste. Last time I spent all the tickets I earned. If I recall there were runes in the event shop and materials for elite runes. Other than the gold key and the titles which as mentioned do nothing which impacts play, the ticket shop is devoid of anything to spend on which we don't already get everywhere else. Yea, what @lythstihl said. Superior + Elite runes need to be added to the event shop as soon as possible. I'm planning to spend my tickets on 23~ish silver keys and a gold key. @Joel will VIP folks be getting an additional gold key towards the end of the event? Check the last bullet point in the original post. Also, we're looking into making additions to the ticket shop. @joel any word on ticket shop additions? If they come too late, it won’t leave us time to decide whether or not to farm tickets for them. List of what will be added, even if it won’t be until such and such a day, would be hugely helpful. Thanks! Ticket shop additions should be up on Thursday at the *latest*. @Joel your the community manager right ? Of all the mobile games with community managers you have to be the best I’ve seen. Other games CM do such a poor job of listening to their community , but I see you out here every day doing your best to listen. Keep up the amazing work! Awesome. Thanks for the response @joel. it will be Hagrim tokens. All day I hear people asking why they can't see the events nor use their event tickets. I thought it must be a level issue. I created a new account and took it to Level 12. I could not see it either. What level do you need to be to participate in event doors and use accumulated tickets? @Joel what level do you have to be to participate in the calendar events? During the Agnon calendar event, Joel stated that level 15 was the lowest level. niclow92, events become visible to players starting at level 15. Can we stop with the “win 40 PvP raids with the new, low star hero” quests? Maybe at least make the refresh free during the event. That’s a brutal hill to climb.